Four Elements (or "4E," as many of us call it) is GameDev.net's biggest annual competition, running for about half a year. We give you four "elements," and you go off and make a game based around them. It runns from "September 27, 2007, at 1000 hours CDT" to "April 3, 2008, at 2300 hours CDT" and the elements (aka pyweek-theme) are Ponies, Accountants, Crystals and Explosions. Even if the competition runns for half a year, it should be possible to put toghether a cool game in a week or so, right? Anyway, it would be cool if there were more python games in the competition..
Trouble running Bouncy on Linux? The instructions in the readme seems to be a bit unclear on what you need to do to run Bouncy under Linux, so if you have trouble in running Bouncy under linux and it complains about a .dylib file not found, read on! Unzip the pymunk-0.1.1.zip file included in the Bouncy zip. It contains Chipmunk (and pymunk, the python binding, but we only need to compile chipmunk for Bouncy to run). The game should work now. Today we also learned to not set the shape id in code (shape.contents.id), and certainly not set the id so several shapes shared a single one (wow, that bug took a loong time to find). Otherwise the physics seem to work ok for our needs. 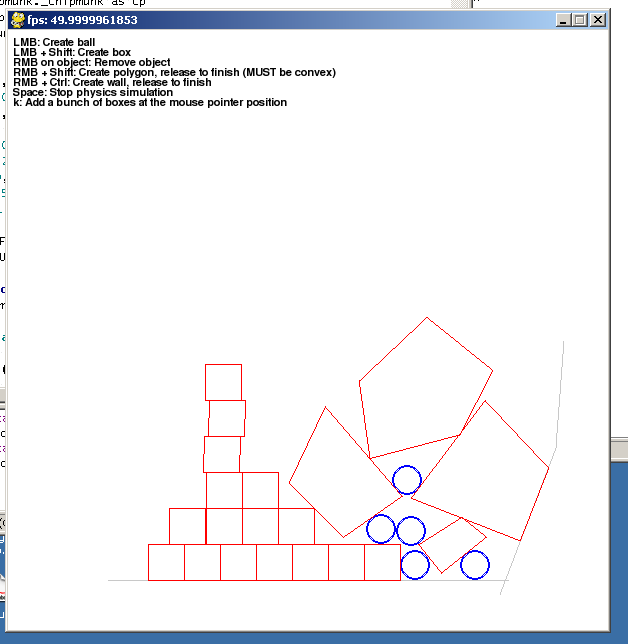 Chipmunk is a 2d physics engine written in C, and can be found here: Chipmunk. pymunk is a low level binding made with ctypes, so you can now use Chipmunk in your Python code! There is no specific pymunk documentation yet except for this readme. as pymunk is just a very low level ctypes binding at the moment. pymunk uses the source from Chipmunk SVN revision 125.
or run build.sh (untested!) to compile. The output should be placed somewhere pymunk can find it. so the low-level stuff had to do for now.